Chhena Kheeri: Chhena kheeri is a sweet dish originally from coastal Orissa in eastern India. Chhena kheeri is made by deep frying cubes of chhena cheese. Although typically ghee is used as the frying medium, chefs frequently substitute this with vegetable oil. The cubes are added to milk and sugar mixture, and boiled further until some of the milk evaporates and the dish acquires a thicker consistency. Boil the 500 ml full cream milk in a pan. Add in the lemon juice to curdle the milk. Keep stirring, till all of the milk has been curdled. Separate the curdled milk through a thin muslin cloth, to get chenna. Wash the chenna under running tap water. Drain out the excess water from chhena, till it is of crumbly texture. Add in 2 tbsp all-purpose flour. Make 10-15 small equal cube shaped pieces with your palms. Heat the oil in a deep fryer or a deep bottomed pan to 180°C. Deep fry the chenna cubes in the oil, for 1-2 minutes. Boil the 500 ml milk in a pan with sugar. Add in the fried chenna cubes to the milk mixture. Cook for about 15-20 minutes or till the desired consistency is reached. Cool down the mixture to room temperature. Add in 1 tsp rose water. Chhena kheeri is ready to be served. 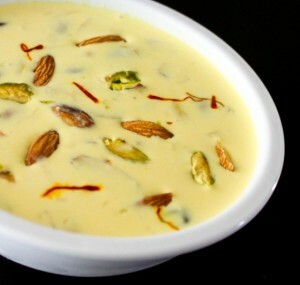 Serve cold, garnished with chopped dry fruits.